"Hi there young traveller," A friendly old man greets you, with a familiar accent. "How may I help you?" "Er... hi there ...", you stammered at the friendlyness. You have expected something much more worse after what you have been through. " I was wondering... er... if you know something about something called well, the Tor Gem." The old man laughed. "You don't believe in that stupid old rumour do you?" he laughed again. Suddenly, he saw the ring on your hand. His smile faded. "Wait here," he then walked toward his cupboard and took out a scroll. "Here you go," handing the scroll to you. "Every visitor gets one." He continues. 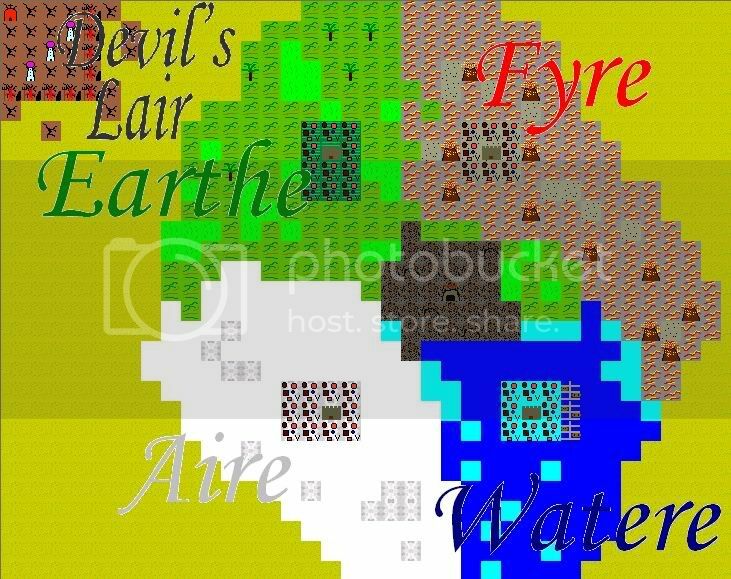 "This is a scroll of this land, divided into four elements, water, air, fire and earth. Don't mind the spelling, its just a fancy way of writing it. Just point to where you want to travel and close your eyes. You'll be there in no time." "What is this?" You asked, pointing at the left-top corner of the map. "Oh that. Erm... just ignore it. I removed the spell from that place already." The old mans looks unconfortable talking about the topic. "You better get going," he said as he opened the door. © 2007 Tong Yiu Yin & Ai Tong School 6A 2007. All rights reserved. All other sources shall be acknowledged.